Camels in the Guelta d'Archei, in north-eastern Chad. 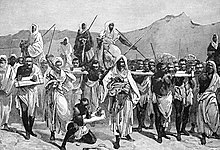 A 19th-century engraving of Arab slave-trading caravan transporting black African slaves across the Sahara. ↑ "Largest Desert in the World". 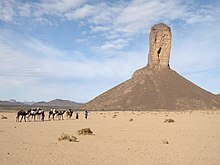 http://geology.com/records/largest-desert.shtml। আহৰণ কৰা হৈছে: 2011-12-30. ↑ 7.0 7.1 Grove, A.T., Nicole (1958,2007). "The Ancient Erg of Hausaland, and Similar Formations on the South Side of the Sahara". The Geographical Journal খণ্ড 124 (4): 528–533. doi:10.2307/1790942. ↑ 9.0 9.1 Walton, K. (2007). The Arid Zones. Aldine. ↑ "Expansion and contraction of the Sahara Desert between 1980 and 1990| Science 253: 299-301". Ciesin.columbia.edu. 1991-07-19. http://www.ciesin.columbia.edu/docs/005-319/005-319.html। আহৰণ কৰা হৈছে: 2010-06-12. ↑ "Sahara Desert Greening Due to Climate Change?". News.nationalgeographic.com. http://news.nationalgeographic.com/news/2009/07/090731-green-sahara.html। আহৰণ কৰা হৈছে: 2010-06-12. ↑ "Rare cheetah captured on camera". BBC News. 2009-02-24. http://news.bbc.co.uk/2/hi/science/nature/7905986.stm। আহৰণ কৰা হৈছে: 2010-06-12. ↑ McNutt et al. (2008). Lycaon pictus. In: IUCN 2008. IUCN Red List of Threatened Species. Downloaded on 06 May 2008.